Welcome to the Elite Road Warrior Podcast where we believe you can leverage the road to transform your work, health, and home life while on business travel. And my challenge is to help you master the business travel life. 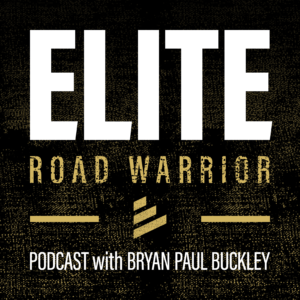 I’m your host, Bryan Paul Buckley and welcome to the unofficial 1st episode of The Elite Road Warrior Podcast. This is the prequel, 411, the backstory, and off the record episode designed to give you the purpose and focus of this podcast so you know what to expect moving forward. Let me answer a question you may be asking right out of the gate (and it just may mean airport gate) depending on where you’re listening to this episode right now. But specifically The Elite Road Warrior concept centers around the Six Energy Habits which we’ll get into the weeds in future episodes. Topics we’ll frequent: productivity on the road / sleep / your health from what you eat and drink to how you move (or don’t move for that matter). We’ll talk about professional and personal development, connecting back home with those you love, and so much more. Well, I’ve done extensive research in this area and have determined with incredible accuracy the sweet spot for this type of podcast is exactly (drum roll please) exactly two hours. So this pre-episode is complete. We were in and out and no one got hurt. I hope this gives you a feel of where we’re headed with this podcast. I challenge you to join THIS Road Trip and come back for episode 001. If you’ve not subscribed, do so right now at no additional charge. Just the kind of giver I am. Until then, do your part to become an Elite Road Warrior today!